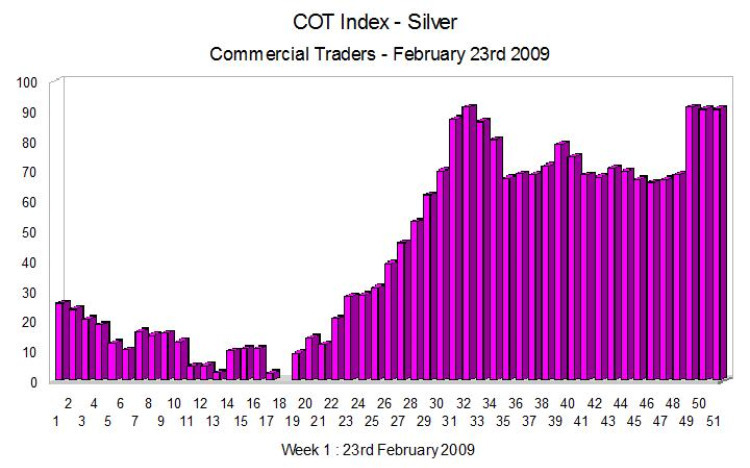 Just like the gold index, the COT index for silver has begun to climb heading back up from the low of 18 weeks ago which suggests that the commercial contract holders are increasingly seeing an opportunity to sell into the rising prices in spot silver, which has been following gold in the bull rally of the last few months reaching just under $15 per ounce last week. From the above we can assume that we are some way from the peak for spot silver prices, and as I have been suggesting for some time, silver is an excellent prospect for a long term buy and hold, with the commercial contracts just starting to sell into the rally. From the above picture I would suggest that silver has a great deal further to go in the rally than gold on a percentage basis which is normally the case when prices are rising. The converse of course is that when prices fall, the silver will fall faster than gold on a percentage basis. If you would like to keep up to date with spot silver prices on a daily basis, then please just follow the link.